Alhambra is an Moorish-themed tile-based board game about the construction Alhambra: a palace, fortress, beautiful gardens and a small city in Grenada, Spain. The best master builders of Europe and Arabia are demonstrating their building skills. 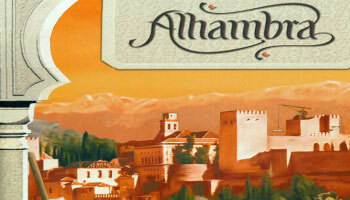 Employ the most suitable teams of builders to construct your Alhambra. 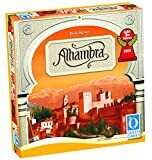 The game exists of a deck of currency cards and a bag of building tiles, as well as a number of boards like a currency market, a building market, etc. On each turn, players can take money from the open money market, purchase buildings or engage in construction and re-construction projects with buildings that have been placed in the player's reserve. You can receive victory points for having the majority in each of the six building types or for having a longer city wall. The game stops when the building market is empty and the finale scoring starts. The player with the most victory points wins the game.